Never skip those hard-to-reach areas again. The Vantage 14 has a patented rotating deck that enables complete scrubbing in both forward and backward directions, allowing operators to easily clean under and around obstacles. Simply push the machine forward; then when needed, easily flip the machine up to allow the deck to quickly rotate for reverse scrubbing operation. With fast and easy scrubbing and water pick-up in all directions, the Vantage 14 leaves a clean, dry surface to boost your facility’s appearance. Employing brush-assisted operation, the Vantage 14 does the hard pushing for you, requiring significantly less physical labor. Adjustable water flow allows you to quickly switch between high or low flow settings, making it easy to tackle the job at hand. Say goodbye to annoying cords and limited scrubbing time and maximize your productivity with the Vantage 14’s fully-accessible, maintenance-free battery, which provides up to 100 minutes of scrubbing on a single charge. An onboard battery charger allows operators to charge the machine in any electrical outlet. The Vantage 14 features an easily-accessible, removable 3 gallon recovery tank and 2.5 gallon solution tank can be quickly filled, drained and cleaned away from the machine, ensuring less mess and minimal equipment maintenance. All machine components are accessible without the need for tools—including the squeegee, which features simple, one hand removal. When you’re done, simply fold the handle and transport the Vantage 14 to storage. Combining innovation, reliability and performance, the Clarke Vantage 14 marks a breakthrough in daily scrubbing for small area cleaning. All these great features, plus we ship this auto scrubber for FREE to any commercial or residential address in the continental United States! 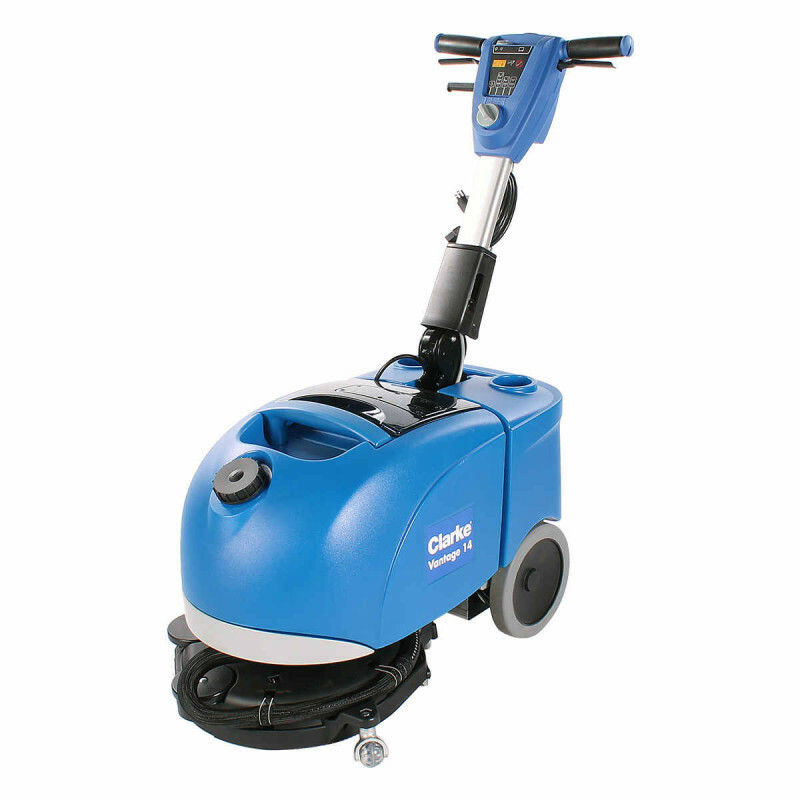 Please take a look at our full line of Clarke auto scrubbers for more options, if this unit is not exactly what you're looking for. Patented rotating deck enables complete scrubbing in both forward & reverse. Easy-to-use control panel has 4 operating mode options, allowing for diverse scrub settings. Foldable/adjustable handle makes transport & storage easy, while the rubber design enhances operator comfort. Durable brush & heavy-duty polyurethane squeegee blades can be easily changed without the use of tools. Superior vacuum system provides 100% water pick-up, leaving floors safe, dry, clean and ready-to-use. Recovery & solution tank can be quickly & easily removed for refill, dumping & clean out. Standard, on-board battery charger saves time & increases productivity. Tall rear wheels with non-slip rubber material provide improved traction. Integrated squeegee allows for forward or backward cleaning.